We will learn each of them in detail below. In request reply pattern client sends the request to WCF service and waits for the response from the WCF service. Until they get a reply no other process runs. After getting a response from the WCF service they will continue its work. If WCF service has a method with void return type then the client will wait for the reply. So in this pattern if any error occurs then it will directly display on the client side. Default pattern for any methods is request – reply. You can declare any method to request a reply by assigning ‘IsOneWay=false’ as show below. 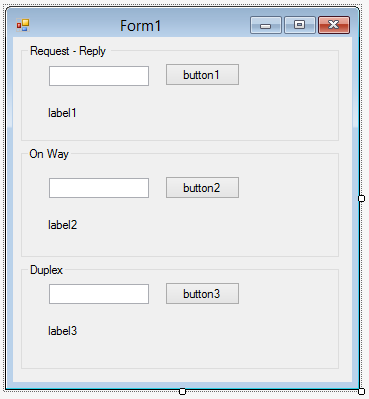 As shown in the above example you can declare request reply pattern in two ways. In One way pattern client sends the data or request to WCF service but it doesn't wait for any reply from the service and also service doesn't send any reply to them, so here the client will not show any thing on service then will only send the message to service. It doesn't check if that message reaches the service or not. You can set this pattern by IsOneway=true. In Duplex pattern you have to predict that there are two clients (client-1, Client-2); client-1 makes request to service and then service will sent request to client-2 and then service gets response from client-2 and give this replay to client-1. Here we specify the call back contract for the interface. This callback interface (IMessageExchPatternsCallback) is implementing on client side. Now create client application with Window form application as below. Now run the WCF service host. Then run client application.